Latest news from air cool engineering (NI) Ltd: In essence...it'll be one BIG radiator under our feet! In essence...it'll be one BIG radiator under our feet! The heat's certainly being 'pumped-up' at our new offices. Last week, all hands were on deck as the team laid nearly 1400m of pipe for our office's underfloor heating AND pumped over two lorry loads of screed into the building. Have a peek at the video to see the screed being 'spread tested' prior to pumping into the offices. What's so good about the screed we've used? 3. 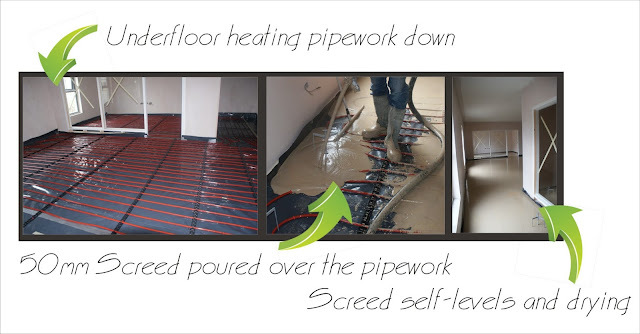 Pumping the screed into place is simple and fast - our office was 'pumped' within 3 hrs! Over the next week, we will update you on the exciting heating system which will make homeowners and businesses alike - rethink how to heat and provide hot water for our properties in the future.